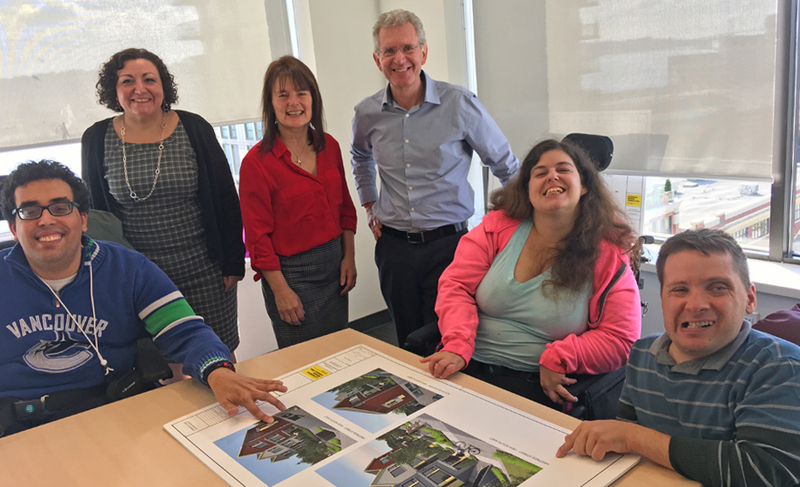 (left to right) Aaron Pietras, Marcela Herrera (CLS Director of Residential Community Inclusion), Gillian Rhodes (CLS Chief Operating Officer), Ross Chilton (CLS Chief Executive Officer), Cassie Campbell and Christopher Ham view plans for a new inclusive housing development being built in their community of New Westminster. Aaron Pietras, Cassie Campbell and Christopher Ham are looking forward to having their own homes, and being neighbours with other residents in a new inclusive housing development in early 2019. The project is an innovative approach to affordable and inclusive housing by Community Living Housing Society (CLHS), with significant support from the City of New Westminster, Community Living Society (CLS) and the Province of B.C. through BC Housing. Aaron, Cassie and Christopher, whose disability related supports are funded by Community Living BC (CLBC), will be moving into the six-unit affordable housing development in New Westminster, which will include three fully accessible one-bedroom units for people with developmental disabilities, rented at income-assistance shelter rates, and three below-market rental three-bedroom townhouses for moderate income families. A number of community partners made this development a reality: the Province, through BC Housing, contributed funding, CLHS will own the project, CLS will operate it, the City of New Westminster provided the land for it, and CLBC will provide funding for outreach supports to Aaron, Cassie and Christopher. Other partners include Vancity, Catalyst and G&F Financial Group. To recognize the partners and the progress made towards getting it built and ready to open its doors, a site tour was held on October 12 during Community Inclusion Month. Aaron, Cassie and Chris are eager to get to know their new neighbours. Cassie, 32, loves to cook and bake cookies, grow vegetables in the garden and watch soap operas, so she’s hopeful some of her new neighbours will share her interests. Cassie will be moving from a staffed residential home where she lives with three other supported individuals. In her new home, she’ll receive supports with daily living but otherwise she’s confident she’ll do well on her own. Cassie likes to socialize and have fun so she’s looking forward to having her family and friends visit whenever she wants, including her newborn nephew. Chris, 29, and Aaron, 23, both grew up in New Westminster and have known each other since high school. The two men recently met Cassie and clicked over their shared interests, such as watching the Vancouver Canucks. They all love their hometown of New Westminster, and will continue to be active in a range of activities they enjoy in their neighbourhood where they can see familiar faces. Aaron has applied to take courses at nearby Douglas College to study business, retail, and communication skills. He is training to be an usher at Massey Theatre. Chris enjoys getting out to his neighbourhood pub where he knows people. They’re all looking forward to planning their own meals in their new homes, and sharing some meals with their neighbours. The units will include technologies and modifications to meet their disability related needs, such as lower tables to prepare food while using a wheelchair, and a doorbell for Cassie that lights up rather than making a sound so she’ll know when she has a visitor. “I’m looking forward to the ribbon-cutting when we move in,” said Aaron. And he’ll be joined by all the members of his community that made it happen. The three of them aren’t sure what their futures will bring, but they know this will be a place to call home for many years to come. Over the last two years CLBC has been working closely with BC Housing, the BC Non-Profit Housing Association (BCNPHA) and service providers like Community Living Society on building awareness about inclusive housing for people with diverse abilities. CLBC has also developed resources on our website to help groups who want to work with their towns and cities to create more inclusive housing. CLBC is also collaborating with Inclusion BC on an Inclusive Housing Task Force, which includes service providers from communities around the province, self-advocates and families. This entry was posted in Community Inclusion Month, Homepage News, Inclusive Housing, What's New and tagged News, Stories. Bookmark the permalink.